Background: Several single chemotherapeutic agents have been evaluated as the second-line treatment of advanced urothelial carcinoma. Despite encouraging efficacy outcomes, toxicity has often led to dose modifications or discontinuation. We aimed to assess the safety of vinflunine in a particular population of advanced transitional cell carcinoma of urothelium (TCCU), that were exposed to the previous toxicity of chemotherapy. 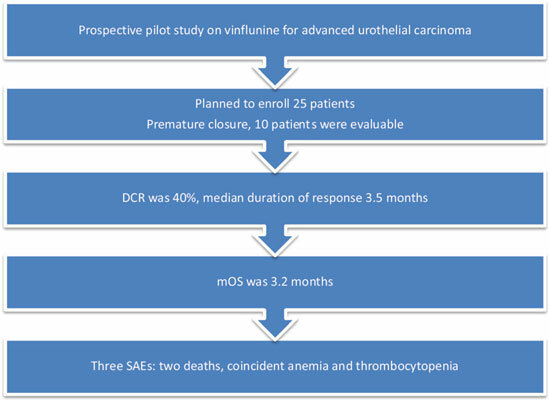 Methods: This is an open-label, prospective, single-center pilot study to evaluate the response rate and safety profile of vinflunine in patients with advanced TCCU. It was planned to enroll 25 evaluable patients. Eligible patients are those with progressive disease after first-line platinum-based regimen for advanced or metastatic disease. Results: The study was prematurely closed due to two sudden deaths that were judged by the review board as treatment-related. Only ten patients were evaluated and received at least one cycle of vinflunine. All but one were male and seven underwent radical surgery. Eight had a distant metastasis (mainly lung and/or liver). Disease control rate was 40%, four patients had a partial response with median duration of response of 3.5 months. The median overall survival was 3.2 months (95% CI:1.67- 4.73). There were three serious adverse events namely two sudden deaths and one grade 4 thrombocytopenia. Nine grade 3/4 adverse events occurred. The most common all-grade adverse events were fatigue (50%), constipation (40%) and vomiting (40%). Moreover, grade 3 fatigue occurred in 30% of patients. Only one patient, who achieved PR for 5 months, was fit to receive further cytotoxic chemotherapy. Conclusion: The activity of vinflunine in advanced urothelial carcinoma came at the expense of its safety. The use of vinflunine has to be limited to the selected group of patients. However, this is a single institute experience in a limited number of patients. Keywords: Vinflunine, urothelial cancer, safety, chemotherapy, second-line, TCCU. Keywords:Vinflunine, urothelial cancer, safety, chemotherapy, second-line, TCCU. Abstract:Background: Several single chemotherapeutic agents have been evaluated as the second-line treatment of advanced urothelial carcinoma. Despite encouraging efficacy outcomes, toxicity has often led to dose modifications or discontinuation. We aimed to assess the safety of vinflunine in a particular population of advanced transitional cell carcinoma of urothelium (TCCU), that were exposed to the previous toxicity of chemotherapy.